"What doesn't help the health of the economy is groundless fear-mongering." EDMONTON — Alberta Premier Rachel Notley is accusing the opposition of being naive and ratcheting up the fear meter over job losses in the lagging economy. "It would be lovely to wave a magic wand and create 40,000 jobs out of nowhere," Notley told the house Tuesday, tracing imaginary circles in the air with her finger. "God knows that group of folks never did it," she added, referring to the Progressive Conservatives, who promised for years while in government to wean the economy off its over-reliance on oil and gas revenues. "To suggest that somehow we can deal with the drop in the price of oil overnight and replace each and every job is ridiculous." Opposition parties have been hammering away at the NDP in the house for days over its proposed budget and its plans to shepherd Alberta through the trough of low oil prices that have carved billions of dollars out of Alberta's bottom line. The NDP budget, along with initiatives already taken, hikes taxes for corporations and well-to-do individuals. It plans a massive construction boom to take advantage of low interest rates and a labour surplus and will work to diversify the economy through job creation incentive programs. The downside is four years of massive deficits and a $47 billion debt by the year 2020. There have already been thousands of layoffs in the oil sector, and Wildrose Leader Brian Jean has said the budget will make a bad situation much worse. On Tuesday, he said comments from the government suggest a review on oil royalties has already determined that those rates will go up. "We can't tax our main industry into oblivion and expect positive results for Albertans," Jean said to Notley. "Why isn't the premier worried that a drastic hike in royalty rates will kill Alberta's oil and gas sector and as a result kill the quality of life of Alberta families?" "It's the same story every morning across every corner of Alberta: investors are fleeing, businesses are closing and Albertans are losing their jobs." "What doesn't help the health of the economy is groundless fear-mongering," she replied. 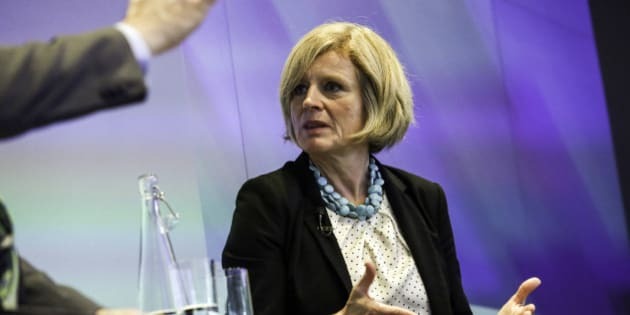 Earlier in the day, Notley responded to TransCanada's decision to ask the United States government to suspend its review and decision on the Keystone XL Pipeline. The line would take Alberta oil across the continent to refineries and ports in Texas and is viewed as critical to Alberta's growth. Notley said the Keystone issue shows that governments need to take more action to reduce greenhouse gases so that they have more credibility when it comes to advocating for projects such as pipelines. Notley says she will take Alberta's plan to improve its environmental record with her when she goes to the United Nations Climate Change Conference in Paris at the end of the month. Wildrose energy critic Leela Sharon Aheer urged Notley to stop running down Alberta's environmental record. "When the premier goes to Paris, will she stand up for Alberta and tell the world that no one produces oil and gas more responsibly than Alberta?" said Aheer. "What I'm going to do when I go to Paris (is) I'm going to start by telling the truth," Notley replied.